So, the 2010 sailing season got off to a slow start for Obsession, but it is now underway. Although we launched the boat on May 30th, the weather was miserable for the first week of June. We also were waiting for our new Harken roller furler to arrive. It finally arrived and was installed on June 16th. Our jib was in Dartmouth for a few small repairs and to make sure the sail would fit the new roller furler system, so we had no foresail for a couple of weeks. Between having no foresail and the weather we were tied to the dock. Jay also didn't bother properly adjusting the shrouds as he was waiting for the new forestay and furler, so we wouldn't have wanted to raise the main without tightening and adjusting the stays. But now, stays have been adjusted, forestay and furler have been installed and we can furl the sail from the cockpit. What a treat! We were never a big fan of the Isofurl system that was on the boat. The system was designed so there was no forestay with the furler itself acting as the stay, so if there was any pressure on it all in any kind of wind, it was difficult to furl. In fact we also almost lost our mast when the whole thing backed off and came apart last year (see blog post April 28, 2010 and Dec 9, 2009 for more details). We went for our first sail on Friday. It was 25 degrees, warm, sunny and a nice 10-14 knots wind. We took about a 23NM round trip out the Montague River into the Northmberland Strait and back. The most difficult decision we made was to turn back! We both wanted to keep going. Cape Breton was on the horizon,tantalizing us. However, we are planing a trip to Charlottetown, Summerside and Shediac, NB soon. And, hopefully, one to Cape Breton later this summer. In PEI, leaving your sailboat in the water all winter is not an option due to the sea ice. They are ususally hauled out in early October and relaunced in mid to late May. 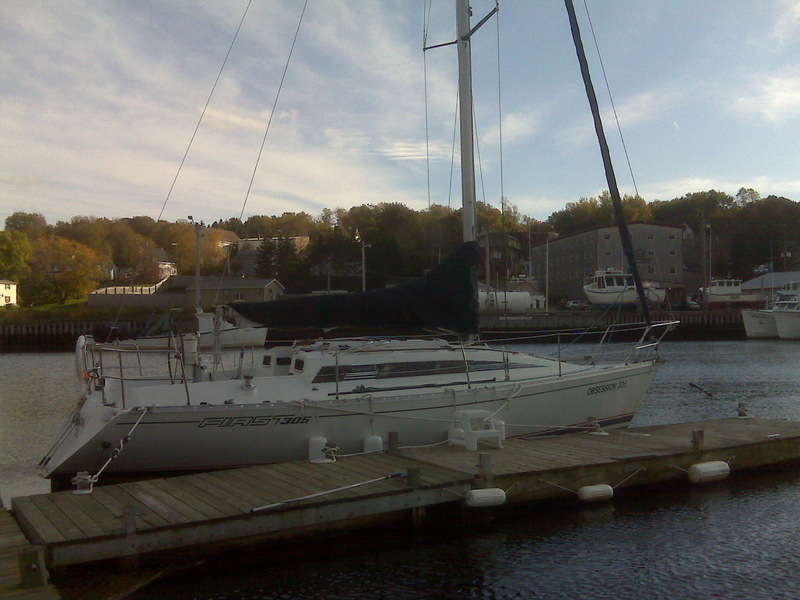 Some marinas, such as the Charlottetown Yacht Club, have permanent boat lifts and mast cranes. In Montague, there is no pemanent boat lift, so each year we hire a crane for a few hours on a Sunday morning and all the sailboats get lifted in to the water on the same day. When the crane leaves Montague it often goes to the Cardigan Marina to lift in more boats. This year there were only 8 or 10 boats that were launched in Montague. Due partly to tides, we did not put the boats in until May 30th this year, the morning after Jay and I returned from our sailing vacation in the British Virgin Islands. Obsession has its own trailer and and we store it in a nearby warehouse over the winter. A few weeks before the boats go in, we get it out of storage and get it ready for the season, scraping and painting the bottom, repairing anything that needs it and checking it out from bow to stern. The mast, which is stored on its own mast trailer over the winter, is also checked while it is down, as are all the halyards. The morning the boats go in the water, we haul the boat and the mast to the marina in Montague, where everyone helps each other get all the boats launched. The boats on their trailers are backed up under the crane, one by one. Large straps are placed under the boat and the crane lifts the boat off the trailer. Lines are tied from the bow and stern and people on the ground hold the lines steady to keep the boat from swinging. The bottom is touched up with paint on those places which could not be done while the boat sat in its cradle, like directly under the bottom of the keel and the area under the pads. The crane then lifts the boats higher, swings around and gently places them into the water. The straps are released from one side and pulled back on land to be used for the next boat. The newly launched boat is moved out of the way and the process starts again with the next boat. In some places, masts are left standing upright on the boats, especially if the boats are stored in a boat yard. In most of PEI, the masts are taken down and stored either laying on top of the boat, on mast trailers, or on mast trees (which hold several masts) at a marina. Masts are then lifted into place after the boat is launched. In Montague, there is a permanent mast crane which can handle most of the masts of the boats which are berthed there. Obsession's mast is 38 feet long and just a bit too heavy for the mast crane in Montague. We launched Obsession last so the hired crane could change the spreaders (used to hold the straps with which the boats are launched) to a hook, and then with the hook, we could tie a line around the mast and lift it into place. Thankfully, other sailors always stick around to help with stepping the mast too. The other boats which can use the mast crane step their masts later that day or over the following week, as weather permits. Boat Launch Day is one of my favourite days of the year. The proimise of the whole summer of sailing is in the air. Well, this blog is about sailing in the Canadian Maritimes, but one of the problems with a northern climate is a sailing season which lasts only from late May to October. This year, we decided to extend our season by bareboat chartering in the British Virgin Islands with our friends, Ian and Julie. We flew to St. Thomas in the US Virgin Islands on May 16th. On the 17th, we took the 45 minute ferry ride from Charlotte Amalie on St. Thomas to West End on the Island of Tortola in the British Virgin Islands. A quick trip through customs and immigration and a short taxi ride brought us to Nanny Cay Marina and Horizon Yacht Charters. The friendly and professional staff led us through the paperwork, chart briefing and walk through of the boat. We had chartered a Bavaria 36, much beamier than our boat, Obsession, and 6 feet longer. It was really comfortable for two couples for 11 days. The boat was in good shape, though the dinghy had seen better days. It was late afternoon by the time all the provisions were stowed, and we left Nanny Cay in a rain shower, which became a downpour and motorsailed our way to Norman Island. We moored in Privateer Bay, around the point from The Pirate's Bight and the famous Willie T. The rain stopped and we had a beautiful evening. It was prophetic of the weather for the rest of the trip. It was hot, sunny with the odd rain shower at night and beautiful breezes every day for the rest of our trip. The next morning, we took the dinghy and motored over to the Caves for some fabulous snorkelling. Afterwards, we went back to the boat and motored around to pick up a mooring in front of the Pirate's Bight where we had a late lunch. Julie maintains they have the best chicken roti in the Islands- and she sampled lots. I, for one, loved their ribs. After lunch, we returned to the boat and set sail for Peter Island. We tacked back and forth across the Channel, enjoying a great afternoon of sailing. Our destination was White Bay, where we had been told there was a nice anchorage. When we arrived, there was a resort with a swimming area marked off and we could not find a good place to set the anchor and ensure sufficient swing room. We abandoned the Bay, which was beautiful, and made our way to Little Harbour on Peter Island. It was a bit crowded when we arrived and we were the last boat to sneak in. It is a favourite anchorage for catamarans, who anchor with a stern anchor set on land. We settled on a spot between a catamaran and another Bavaria and set a stern anchor on land. Jay and Ian had to chose their footing carefully on land as sea urchins were everywhere. After a frustrating attempt to keep the charcoal BBQ lit, we settled on pasta for supper. The following day we set sail for Spanish Town on Virgin Gorda. It took several attempts in the wind to grab a mooring ball as there was no float on the pennant. The mooring field was quite rolly, and so after a half hour we decided to move into the Marina for the night. Moorings are, on average, $25 per night. Most marinas seemed to average $1.50 per foot., though they only charged us $1 per foot at Spanish Town. Showers were the first stop for everyone. The marina has fullservices, shops, a grocery store, restaurant and laundramat. The next day we set off for the Baths, an amazing natural attration, with gigantic boulders strewn across the beach and lagoons, creating an amazing place to swim, snorkel and explore. After grabbing a mooring, we took the dinghy to a dinghy mooring closer to shore and swam and snorkelled to shore. We spent several hours at the Baths and wished we had planned for longer. But feeling hungry, we made our way back to the boat and had a late lunch. We then set sail for Marina Cay and Pusser's Landing, just off Tortola. We picked up a mooring and took the dinghy to explore the Island. Owned by Pusser's Rum Company, the Island boasts a restaurant, a bar, showers, a resort and a Pussers Rum Store. Neat views from the top of the Island. The next day we set sail for Leverick Bay on Virgin Gorda. We took a mooring for the night and went ashore to explore. Shops, a restaurant serving PEI mussels, and a swimming area were highlights, as well as shower facilities. There are no pumpout facilities in the BVIs, so we all became very good at finding bathrooms on land as well. There was also a small grocery store and we topped off our provisions. We finally had some success with the BBQ that night and were lulled to sleep by the music floating over the waves from the shore. We left the following day for Anegada. We had a great sail and carefully picked our way through the coral into the mooring field. Talk about some tense moments motoring inthe channel. In the mooring field we thought we were safe, but we were still moving extremely slowly, thankfully, as we had what one might call a soft grounding. It took only a minute to get off, but we were acutely aware of the six and a half foot draft of our boat. The water is so clear, you could see the bottom, but it was impossible to tell exactly how deep it was. Anegada is the lowest lying Island and is at most 28 feet above sea level. Its name means "drowned land". And it is surrounded by coral reef. It is best known for its beaches. You take the dinghy to shore and then take a bus to the other side of the Island for the beach. It was incredibly hot on land, so we opted to stay on board and read, relax and nap for the afternoon. Ian strung up a hammock and baked in the sun. I saw a sea turtle on the surface of the water dive under. It was idyllic. In the evening as we were boarding our dinghy to head to shore to eat at one of the outdoor beach restaurants, we heard a couple arguing on a nearby catamaran and saw four others leave the arguing couple to it and take their dinghy to shore. A reminder that a boat is a small place and you better hope you get along with your crewmates! Ashore, the guys had lobster, a local specialty, but decided that they preferred Island lobster hands down. We left Anegada the next morning and headed for the famous Bitter End Yacht Club. We took a marina berth for the night. The showers for the marina were neat. Built over the water, you can see the water through the floor boards and the shower drained right into the water. The monohull next to us was a Jenneau 45 and was owned by Mike and Barbara, the couple who own Pirate's Cave Chandlry in Southeast England. A wonderful couple, who spend 13 weeks or so a year in the BVIs, we enjoyed meeting them and learning about some of the hidden gems of the area. We watched a movie at the outdoor theatre and managed to stay up until 11pm. This has to be the only vacation I ever took where I was up at 6am every morning and in bed by 9:30 or 10pm! The next morning we set sail for Road Town on Tortola, the main settlement on Tortola. We spent the night at Village Cay Marina. It had a pool, laundry facilities and showers and was right in the heart of town. Unfortunately it was a holiday, so many of the shops were closed. In the evening we went for a walk and came across a youth percussion marching band which we listened to for awhile. We had dinner at Pusser's Pub, had amazing gelato and reprovisioned at Bobbby's Market, which only closes for Christmas. The next day we wandered around to the shops (including another stop at the gelato shop) and near noon we left for Jost Van Dyke. We had to motor part of the way as the wind was directly ahead of us. We moored at Diamond Cay off Jost Van Dyke and went for a swim and snorkel. After, we went for a drink at Foxy's Taboo. Then we took the trail to the Bubbling Pond. There wasn't much of a swell from the north so the bubbling was fairly minor, but we took a refreshing dip nonetheless. We spent a quiet night aboard. Jay slipped and badly bruised his hand, which meant he spent more time on the wheel than pulling lines for the rest of the trip. The next morning made our way around the point and down the coast a short way to Great Harbour. We took the dinghy in to the famous Foxy's Bar for lunch. The place is decorated with t-shirts, business cards, shoes, and every imaginable piece of clothing which sports the names and dates of those who have been there before. We had nothing but Obsession boat cards with us, so Ian and Julie added their names too and we left the card as our contribution to the decor. After lunch, we made our way to Norman Island, where we decided we would spend our last night. We took a mooring off the Willie T and went to Pirate's Bight for dinner that night. Our last morning on the boat, we motored the 20 minutes around the point to the Caves and the guys went snorkelling for the last time. The best snorkelling we found was there at the caves. In a rain shower, we made our way back across the Channel and into Nanny Cay to return our boat for noon. Filled with wonderful memories, we left the boat for the last time and made our way back to St. Thomas and the flight home the next day. Although our thoughts were turning with excitment to the upcoming sailing season on Obsession at home, Jay and I are both determined to return someday to sail more in the beautiful BVIs.